For any other request, as a test on only one product, you can contact us by Phone at 33 1 47 54 03 13, by Fax at 33 1 47 54 04 14, or in using the following mail : contact@papier-innova.fr, in just giving us your entire postal address, the reference of the product you wish to test and your printer's model. On receipt, we will send you directly and for free the sample requested. - For Color Ink Jet printers, we have six references of photographic papers in our first range called Premier, from 175 to 305 gsm, in Glossy or Semi Mat. - The second range, called Classic is composed of High Resolution coated papers from 100 to 230 gsm. 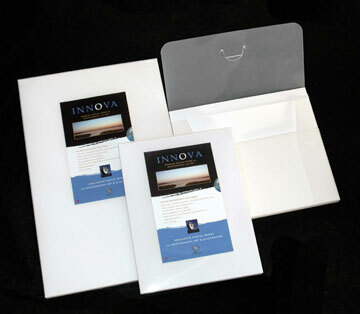 We have also a full range of double side coated papers from 100 to 230 gsm. - The third range is made of Adhesives, papers, vinyl or polyester. All those products are available in A4, A3, A3+ and A2 formats. Rolls of 17, 24, 36, 42, 44, 50, 54, and 60 inches are also offered.- For black and white laser printers, we offer a full range of transparency films (UV insolation) for screenmakers and offset print shops. Those films are availables in various classical sizes like DIN A4 and A3, but also in wide formats A3+ (up to 330x895mm) which is a unique solution for many people who owns large format black and white printers. We have also a beautiful offer for color laser printers and copiers like A4 and A3 adhesives for inside or outside uses. White mat and glossy polyester and transfer papers complete this range of laser medias.